On Thursday evening, I arrived home to find a package waiting for me. My address was handwritten on it and the return address was for a Michael Cockburn (the surname was not entirely legible, so at the time I thought I may have misread it) in Saint Albans. I don’t know anyone of that name, nor was I expected anything except for a couple of packages from Amazon. 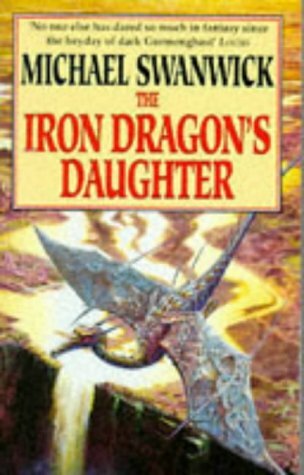 Intrigued, I opened the parcel to find an old and somewhat battered copy of The Iron Dragon’s Daughter by Mike Swanwick. This was a book for which I had searched for many years, until the lovely Ashley bought me a copy about four years ago. At once, I began speculating about who the kind donor might have been, what the connection was to Mr Cockburn, why they would send me a book that I wanted very much years ago, how they knew I wanted it then but not that I had acquired a copy since, and where they got my address. Over the next few hours, I found that to the best of my knowledge I had mentioned the book twice online (once in private mail, once in an allusion to said mail on the Culture mailing list), that Michael Cockburn indeed lived at the return address, that he was a go player, and not much else. I began feeling like a character at the beginning of a Murakami novel, with reality just slightly perturbed from its normal course as a portent of the escalating oddness to come. All my lines of investigation fizzled out and I was left with only one option: writing to Mr Cockburn to learn the full story. For the next several days, I began to draft in my imagination the perfect letter, balancing gratitude with bafflement, not wanting to offend if in fact he was a forgotten acquaintance but determined to learn the truth. But before I set pen to paper, my mysterious benefactor stepped from the shadows and revealed the truth. I am very grateful both to know that truth and for the thought behind the gift.